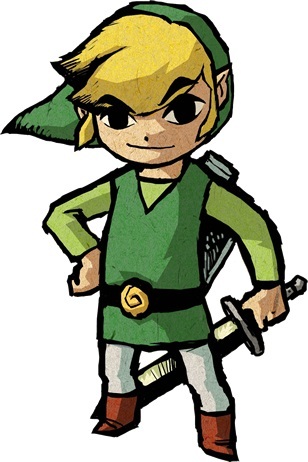 ← Zelda Challenge Day 11: What Did I Register My Name As? I’m generally not a great fan of side-quests. I like a story, straightforward, and while that story can deviate into as many plots and sub-plots as you like, I hate having to roam around and find them, ya know? And some of these side-quests can get pretty convoluted, even hectic! One minute, you have a letter to deliver, the next, you have to deliver mushrooms before they spoil. One minute, you have something in your inventory and go, “Oh, this character here might like this!” And the next, you are running around like a chicken with your head cut off, racing pell-mell from one corner of the map to its exact opposite, across a field, up a mountain, through monsters, to deliver a bottle of eye-drops to a gigantic goron! Yes, the huge sword can be worth the effort at times, but it’s still annoying to me. Oh, if only there were a side-quest that didn’t take you all over the freaking place! Something simple and straightforward, if also challenging! Oh, to find such a one as that! …ladies and gentlemen, I present to you, from Wind Waker: the Savage Labyrinth! Admittedly, perhaps a little misnamed as it wasn’t like an actual maze or anything like that, but title notwithstanding, this was my kind of side-quest! No running around, no wondering what the heck we’re supposed to do, just fifty-one floors of straight-up battle against enemies numerous and diverse, each level more difficult than the last, in a a true test of combative skills and endurance! Obviously, this was not a test to undertake lightly, without substantial provisions. I made sure to load up on everything I could possibly need before ever setting foot in the Savage Labyrinth. It started out easily enough, of course. Then things got progressively more demanding, and surprising, with the foes they stocked this little mini-dungeon to the brim with. Soon enough, I was starting to be hard-pressed, and I knew that every blow I took earlier would be a severe disadvantage later. The enemies grew more numerous, and stronger, and then the stronger enemies grew more numerous! I completely lost count of which level I was at, as I got pushed harder and harder, and had to use every skill and weapon at my disposal! Eventually, each level was ending with, “Come on, I’ve got to be closing in on the end by now!” As I got stretched pretty thin, the temptation to turn back grew strong, but no way was I wasting all the effort I had just put into this! And then, right when I was on my last reserves of everything, most especially life… the end! Whoooo! The reward did not really match the effort of this, but the effort was it’s own reward, really. Well, that, and the victory! It very nearly killed me, but I triumphed! Tremble before my might, ye hordes of evil, and despair! This entry was posted in 30-Day Zelda Challenge, Challenge Accepted, Games and tagged Legend of Zelda, Savage Labyrinth, Wind Waker. Bookmark the permalink.